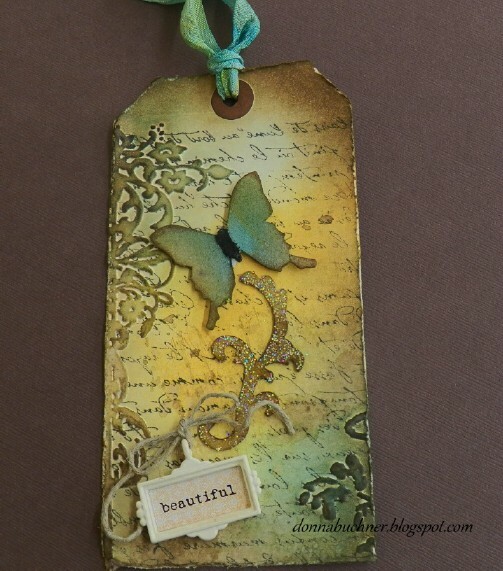 I did not have the reflections stamp so I had used a script stamp (something that I was not able to read lol) The flourish below the butterfly was embossed with the ancient gold embossing powder by ranger. I liked the sparkle :) both the butterfly and flourish were cut from the grungepaper. Your tag is worth waiting for, Donna. Interesting textures and layers! And, as the framed sentiment states, "beautiful!" Such a pretty tag. I love the soft background you made. Love the gold embossing and the great frame with the sentiment.